Registration will close on April 8th, 2019 or when bus capacity is reached. Registration pays for the bus, lunch, snacks, and beverages. Space is limited to 76 attendees, so register now! Wilburton is a contemporary yet distinctly neighborhood elementary school, developed on an unimproved site in a residential context. Learning spaces in this Microsoft Showcase School are flexible and dynamic, and technology throughout ensures learning can happen everywhere – even outside. 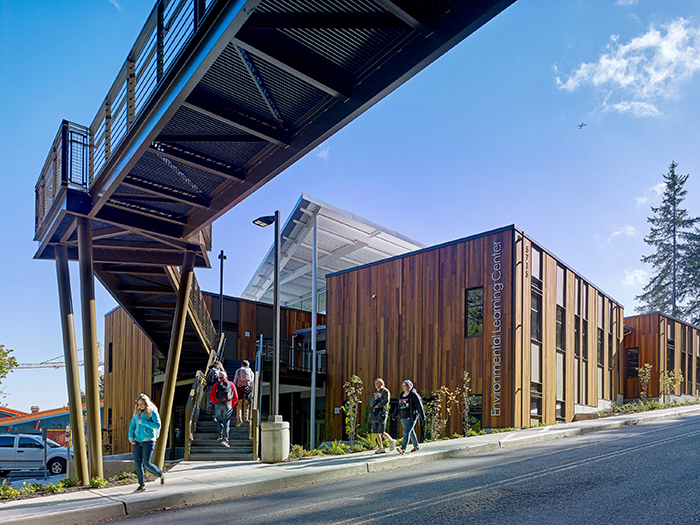 A variety of active and passive sustainable strategies make Wilburton among the most environmentally efficient new schools in the Pacific Northwest. To respond to growth in the Renton School District, Sartori Elementary School was developed as a choice STEM elementary school. 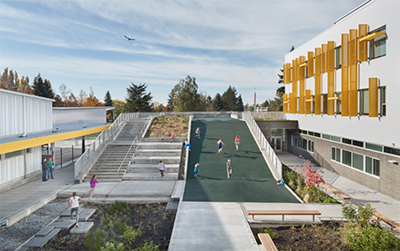 The school district worked closely with the City of Renton to develop a 3-story facility on a tight urban sight that foreshadows the urban growth master plan. The school is also planned to support the greater Renton community, through thoughtful site and program placement to support shared use of spaces outside of school hours. On a steep, wooded hillside in suburban Bellevue, the Bennett Elementary School replacement integrates architecture with its site to create a cozy, intimate user experience. Three terraces allow each floor to convey a smaller scale, connecting with nature and the surrounding community in various ways to enhance daily learning. 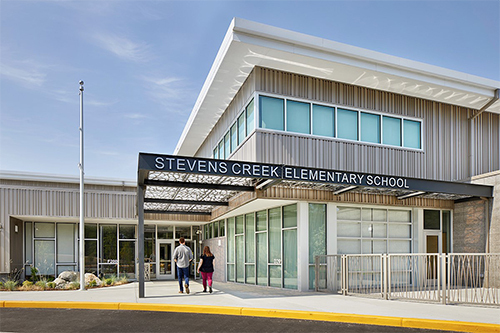 A new school built on an undeveloped greenfield site, Clara Barton Elementary School celebrates the connection between the built environment and the surrounding natural context. Flexibility, transparency and the integration of indoor and outdoor space work together to offer students and staff an adaptable and inspirational contemporary learning environment. We greatly appreciate your attendance and active participation in our chapter events. And a big THANK YOU to Lisa Senn of Hutteball & Oremus for their help with planning this event! 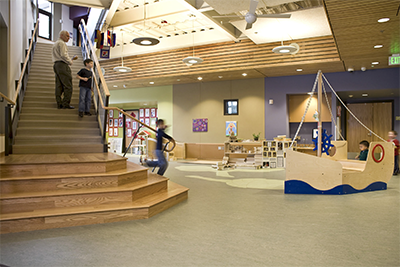 The Stevens Creek P-5 campus incorporates both a preschool and elementary school on the site, with both facilities demonstrating a progressive model for educating young children. District Planners will be interested to observe the programmatic spaces designed for shared activities, collaboration, exploration, discovery, and self-directed learning. In the design of the Early Learning Center, gentle, organic curves inherent in nature help create shared interior spaces. These shared areas encourage collaboration between teachers and also help to reinforce the importance of learning outside of the classroom. This begins to infuse a sense of fluidity into a child’s everyday experience. Color and texture provide wayfinding throughout the building’s corridors and are used to identify specific zones within the classrooms and common spaces. 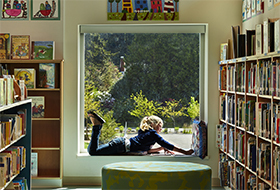 These spaces are designed with the scale of preschoolers in mind: a child-sized door provides students with a sense of equality and play at the front entrance, and several nooks located within the common spaces encourage self-directed learning and reflection. Students move further along the campus to Stevens Creek Elementary as their educational careers progress. The design of this school further accentuates the importance of collaboration, exploration, discovery, and self-directed learning. Collaborative spaces, including the Maker Space and the Learning Commons, are prominently featured and make up the heart of the school. Exploration is evident through celebrated distant mountain views and accessible campus rain gardens, both ripe for educational discovery. Self-directed learning can occur while students are reading famous quotes scattered throughout the building, through native plant signage used as wayfinding within classroom wings, and in the various breakout spaces located throughout the building. Additionally, classrooms are transparent and visually connected to adjacent shared spaces, encouraging collaboration between both teachers and students. The classroom spaces also have visual connections to outdoor learning spaces, daylight, and their natural surroundings. School District employees' first dinner is free! Spread the word and introduce a new School District employee to A4LE, encourage them to sign up online for a free first dinner. We greatly appreciate your attendance and active participation in our chapter events. In 2010, Monroe School District staff, Park Place Middle School staff, design consultants and Integrus Architecture worked together on a successful bond campaign to transform Park Place Middle School. After evaluating the existing facility and working closely with members of a Design Steering Committee, a master plan was developed and it was determined that a significant portion of the existing school be re-built on the existing site. Significant challenges that the master plan addresses include developing a design to accommodate phased construction while the building remains in operation, simplifying bus and auto traffic patterns on the site, redeveloping fields, and supporting both existing and anticipated future programs. The new, two-story school facility is approximately 123,000 SF and sized to serve 850 middle school students in grades 6 through 8 from the local community. In the academic wing, clusters of learning spaces are comprised of three general classrooms, one science lab, one group room, a shared learning area, and service facilities such as restrooms and storage. Art is grouped with CTE, digital studio, and food science as closely-related creative disciplines. These active learning environments have higher ceiling heights and are adjacent to outdoor work areas. Together, these learning environments anchor the south side of the academic wing of the new school. West of the academic wing, the band, drama, and choir rooms are located between the Gymnasium and Commons, so that musical and dramatic performances will be integral community gathering places. Site improvements include refurbished sports fields with synthetic turf soccer field and all-weather track, new vehicular circulation and parking areas approximately equaling existing parking counts, new planting and gathering areas with the goal of providing clear pedestrian and vehicular circulation, and improved overall campus safety with new driveways and landscaping. Built in 1932, this two-story municipally landmarked historic school originally offered (10) classrooms and a large cafeteria which also served as a shared use community gathering room. 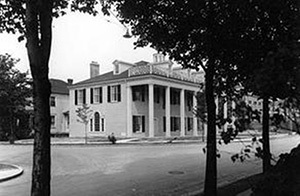 In 1946, a wing was added which housed two kindergarten classrooms, a library, three general classrooms and a girls’ gymnasium. Beyond periodic improvements and upgrades necessary to remain operational, Loyal Heights, with a capacity of 450 students, had been essentially untouched since the 1946 addition. The design encompassed a comprehensive reorganization and renovation of all interior spaces, preservation and rehabilitation of the building envelope, the addition of 51,400 SF of new learning and support space, and significant site circulation improvements. The existing covered play structure was demolished to accommodate expansion and was replaced with a new covered play area. The existing lunchroom was restored and repurposed as the school library; and a new gymnasium was added where portables were formerly located. A new commons space with stage and music room now adjoins the gymnasium and serves as a lunchroom and flexible multipurpose space. An operable partition between the gymnasium and commons allows the spaces to be combined for large school and community events. Our annual A4LE Holiday Social will be Wednesday, December 5th from 6:00 pm to 9:00 pm at Emerald City Trapeze Arts. 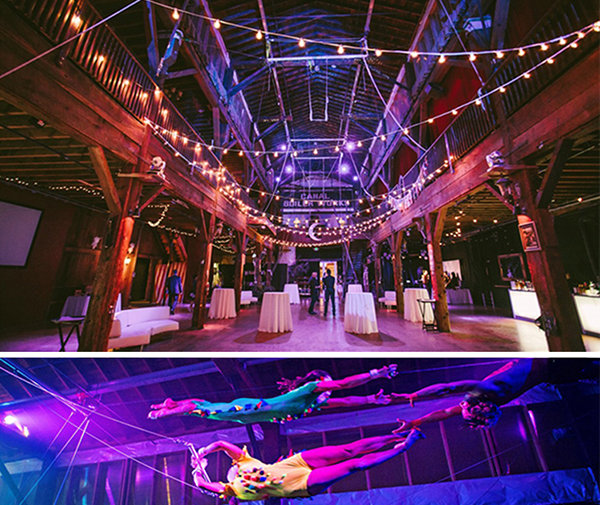 Along with the opportunity to visit with each other, there will be a trapeze performance at the event. Food will be provided, and all attendees will receive 2 drink tickets. Additional beverages will be no-host. There is no charge for members to attend. Entry for non-members and guests is $30. We do ask that you register by December 2nd to help us plan for the number of attendees. In response to growth, Northshore School District was in need of a new high school on a 61-acre site in the north end of the district. A Visioning Team, comprised of students and key business and industry partners, was assembled to engage in conversations that explore the link between instructional program opportunities, facility design, and career pathways for future students. The results of this Visioning challenged us to create a place that provides learning experiences at every step, inspires exploration, and stimulates the senses while balancing a celebration of nature and culture. The result is North Creek High School, a comprehensive high school with a capacity of 1600 students, a focus on STEM and project based learning, and a goal of achieving “deep green” design. To emphasize its image as a civic amenity, the site frames the building’s main entries and important features, including entry plazas, courtyards, outdoor classrooms, and pedestrian footpaths. The overall school design fortifies its social and academic functions by creating spaces that communicate a strong sense of civic pride. School District employees' first dinner is free! Spread the word and introduce a new School District employee to the Association, encourage them to sign up online for a free first dinner. The new Environmental Learning Center is a public asset that supports greater understanding and appreciation of nature’s ecological systems and our relationship to them. The Center is located in Point Defiance Park, a 700-acre urban park surrounded on three sides by the waters of Puget Sound. Amenities in the park include the Zoo, gardens, beaches, trails and most notably, a stand of old growth forest. 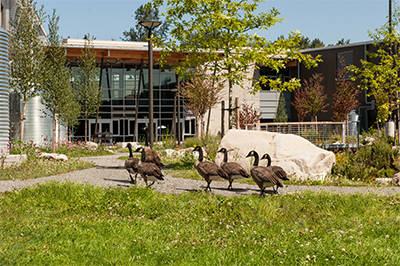 The Environmental Learning Center is a partnership between Tacoma Public Schools and Metro Parks Tacoma to support education, sustainability and conservation. This joint-use facility is located on Point Defiance Zoo & Aquarium grounds and features eight formal learning settings for SAMi and community use, communal space for collaborative and interpretive activities, planning/work space for SAMI and Zoo educators, coordination/work space for Zoo staff and volunteers, and a setting for a nature-oriented early learning experience. 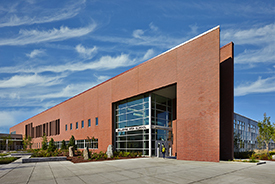 The new three-story Sammamish High School was constructed on the same site as the existing single story facility. The new facility embraces an existing Theater, and field areas were maintained. The comprehensive high school had embraced problem based learning curriculum, and through the design process, the facility was built to support student led learning – including break-out areas, STEM studios, and strategically locating program areas to support formal and informal testing and presentation of ideas. Social areas encourage school community through creating vantage points to be connected between floors through a 3-story atrium. The large sloping lawn elevates the school entry point to the second level, creating a main floor that is centered vertically on the site with the administration areas, library, commons, main gym and staff rooms at this level. 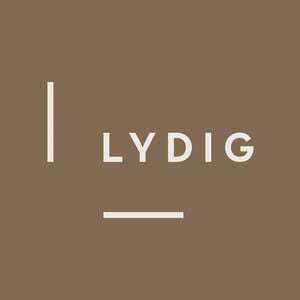 Food Service Consultant: Stafford Design Group, Inc. 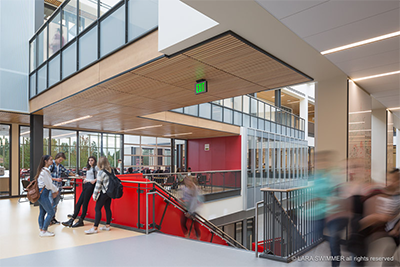 Please join us for a tour of Sammamish High School by Integrus Architects and Bellevue School District. Please join us for our annual year end business meeting to confirm next year's Board Members, as well as to present this year's Al Beck Award recipient and Merle Kirkley Scholarship Winners. Registration will close on Monday, April 9, 2018. Registration pays for the bus, lunch, snacks, and beverages. Space is limited to 79 attendees, so register now! At 94,000 SF, the new Lake Wilderness Elementary is among the largest elementary schools in the state. The program divides space into compact, efficient learning neighborhoods. The building form responds to the residential context and site topography, while the interiors are infused with a sense of whimsy to create a friendly, intimate environment for students. 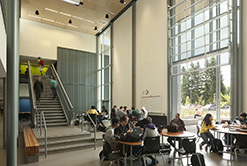 The new Tahoma High School and Regional Learning Center provides a comprehensive learning environment coupled with career and technical education as a community-focused resource in the heart of Maple Valley. Designed to accommodate 2,600 students in grades 9-12, the building encompasses 315,000 SF on a 46-acre campus. The new Health Sciences Building doubles the capacity for dental assistant and nursing assistant programs at Puget Sound Skills Center. The new building contains a lecture hall, three classrooms, a nursing skills lab, a biology lab, a dental skills lab and the Sea Mar Dental Clinic. It provides the PSSC campus with visibility from Des Moines Memorial Drive and creates an identity for the school. We greatly appreciate your attendance and active participation in our chapter events! A4LE is joining together to give back to our community. Rainier Beach High School in Seattle was selected as our Day of Service Project on March 31st from 9am-4pm. 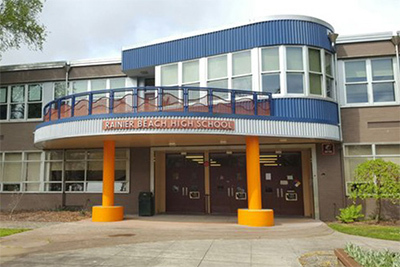 Rainier Beach is in need of a refresh to bolster student pride in their school. The 2018 A4LE Service Day is focusing on the front entry, courtyard, and Gym/PAC lobby as our primary spaces to improve. Volunteers will work together doing tasks such as weeding, planting, mulching, laying gravel, painting, installing an accent wall, and graphics. Please join us in giving back to the students and community of Rainier Beach by donating funds, products or volunteering your time on March 31st! Volunteer all day, morning, or afternoon. To find out about sponsorship opportunities, please click here. Arlington is a cost-efficient exploration of what spatial possibilities emerge for schools when education is considered a living, breathing organism; that requires facilities be evolutionary. Tacoma’s Vision was that there would be no classrooms at Arlington; there would only be spaces for learners and learning activities. In response, the design centralizes direct instruction spaces flanked on each side by shared learning that moves both up and down in scale. Where the traditional classroom school model gives each learner/teacher access and ownership to a single primary group learning space, Arlington gives each learner/teacher multiple interconnected spaces that allow nimble freedom of movement, group size, program development and collaboration. All while making cost and space efficiency, as well as connectivity and future transformability, paramount. 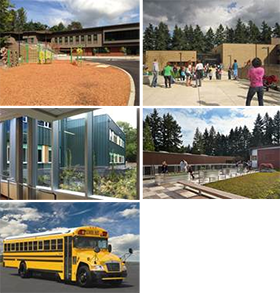 Please join us for a tour of Arlington Elementary School by Mahlum Architects and Tacoma School District. The Progressive Design-Build (PDB) alternate procurement method is being considered by more public agencies in recent years. This experienced panel will provide some background and definition to PDB as well as a discussion on when it could be a good fit, helpful tips in managing risk, and pitfalls to avoid from the perspective of the owner, the owner’s consultant, the design-builder, and the designer. This should be a very informative and interesting discussion for our group to participate in. The idea of a kindergarten-only school presented both challenges and opportunities for this new facility. Designing for 600 students in a single age cohort is a unique opportunity. The idea of reducing transition time for students set the course for the design that followed. The students are shielded from the enormity of the school with the scale broken down into pods with family style dining opportunities and adjacent classroom interaction. 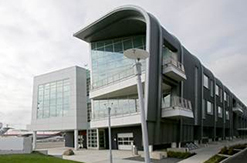 Educators and planners will appreciate a first hand look at this unique facility. Please join us for a tour of Pathfinder Kindergarten Center by DLR Group and Mukilteo School District. Sally Knodell of Environmental Works and Poppi Handy of Third Place Design Co-Operative will provide overviews of child care center design opportunities. They will discuss typical built environment components and how seemingly daunting child care regulatory requirements, when combined with child-focused design features and operational accommodations for adults, create environments for children to thrive during the neurologically and developmentally all-important ages 1–5 and be prepared for a life of learning. 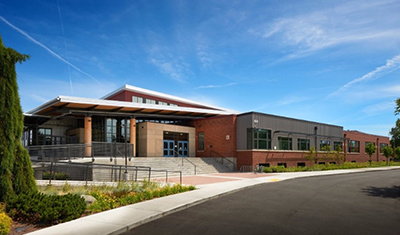 Please join us for a tour of Stewart MS by Bassetti Architects and Tacoma School District. WAMOA (Washington Association of Maintenance and Operations Administrators) In the spirit of improving collaboration between our organizations, since both are equally important in providing the best possible learning environments for our children, Paul Harris will be presenting a summary of their recent "Dear Designer" brainstorming sessions. This is intended to inspire an open discussion so prepare to engage and share your ideas and questions. In November, Taine Wilton of Edmonds SD represented A4LE to present at a House Capital Budget Committee meeting in conjunction with OSPI and WAMOA. We thought the members would appreciate seeing her portion of the presentation, focused on what makes a great 21st century learning environment. Like many historic schools, the original facility was disjointed from years of incremental modifications and organized around the cells and bells model of teaching. Additionally, the school building is an important anchor in the community, yet prior to the renovation it was not accessible to many. The project breathed new life into the building providing spaces to support twenty-first century learning, community spaces, and access for people of all abilities. The design team focused on enhancing the historic feel in the entry sequence leading to the converted/restored auditorium while prioritizing things like large glass sliding doors at classrooms in the rest of the school. Most importantly, the renovation focuses on showcasing STEM education in the project labs, physically and visually connecting the whole school, and providing a new social hub for the school and the community at the heart of the school. Our annual Holiday Social will be Wednesday, December 6 from 6:00 – 9:00 pm at The Westland Distillery. Along with the opportunity to visit with each other, tours of this unique small batch distillery will be available for those interested. Food will be provided, and all attendees will receive 2 drink tickets. Additional beverages will be no-host. There is no charge for members to attend. Entry for non-members and guests is $30. We do ask that you register by December 4th to help us plan for the number of attendees. 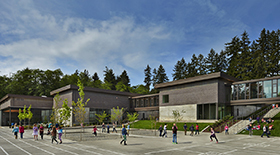 Please join us for a tour of Hazel Wolf K-8 by NAC Architecture and Seattle School District. This session explores the benefits of taking teaching and learning beyond the traditional classroom. We examine the benefits thereof through three distinct lenses: education researcher, teacher and architect. Lauren Scranton, NAC’s Architecture education knowledge leader, presents the findings of her investigation into the effects of outdoor learning on students’ academic achievement and overall growth. Christine Benita is environmental science educator and school program coordinator who has spent the last 8 years developing a pioneering K-8 school’s E-STEM curriculum with a particular focus on the environment and sustainability. NAC design principal Boris Srdar examines a variety of project examples from around the world that explored a multitude of outdoor learning practices. This urban site is conceived as a lab with a variety of indoor/outdoor learning areas. The site and building are intertwined, both conceptually and physically, which evolves the project typology by blending traditionally separate parts of the school program. The new school is a counterpoint to the typologically diverse surrounding and a new urban form generator at the same time. Developing a pioneering E-STEM program at Hazel Wolf K-8 required a design that sought every opportunity to create diverse exterior educational spaces. The tight, 3.2-acre triangular campus was a significant challenge, and deliberate organization of the site and building was imperative to maximize use of outdoor areas. The site was extended over the buildings to double the area of the central learning courtyard. Diverse outdoor learning environments such as a butterfly garden, a botanical garden, and Reggio Emilia play/learn areas each support a specific curriculum. Hazel Wolf is a current MacConnell finalist and Polished Apple Winner. School District employees' first dinner is free! Spread the word and introduce a new School District employee to the Assocation, encourage them to sign up online for a free first dinner. Please join us for a tour of La Conner Middle School by Hutteball & Oremus and La Conner School District. Note the later 4:30 start time to allow for the extended travel time. Please join us for a presentation by mixed media artist Mary Ennis Davis about her process creating the La Conner History Wall. Located prominently in the lobby of the middle school, this large scale composition uses digitally altered images and three-dimensional objects to create a contemporary art installation to honor both the history of the town and La Conner School District. The future of education in the La Conner School District pays respect to the community and traditions in which it is situated. Positioned between two facilities of contrasting eras, the middle school carefully blends contemporary architectural elements with materials that pay homage to the historical characteristics of the previous school building and other campus facilities. Utilizing reclaimed bricks from the original 1935 school building, a large fireplace was constructed within the middle school library. Sections of the old gymnasium flooring were repurposed as tables throughout the school, and incorporated into an accent wall in the new gymnasium. Located across from the administration offices, the La Conner History Wall, documents the role and importance of the district within the greater community. Civil Engineer: Northwest Datum & Design, Inc. Please join us for a tour of Lynndale Elementary School, Edmonds School District by Mahlum and Edmonds School District. Please join us for our year end business meeting to announce next year's Board Members, as well as to present this year's Al Beck Award recipient and Merle Kirkley Scholarship Winners. With six decades of commitment to excellence, the powerful pride of the Lynndale Lions continues on in their new 68,000 SF building just south of Lynndale Park. Located on the same site since 1957, Lynndale previously occupied a single story, pavilion-style cmu block building with very little access to daylight, no connection between learning spaces and, although adjacent to a large fish and wildlife conservation ravine, was sited to turn its back on nature. The new Lynndale forms an "L" that holds a semi-protected triangular courtyard with building and ravine as equally important edges, allowing both view and physical connection between every learning space and the ravine. Organized into three small learning communities of K-1, 2-3 and 4-6, the design emphasizes collaboration and connectivity between grade pairings. Every two classrooms share a small group room; across the hall for K-3 to aid para and volunteer inclusion programs, and nested within the classrooms for 4-6 to address developmentally appropriate independent learning. A second, smaller "L" formed by community spaces, including the gym, music, library and common areas, runs parallel at the north end and then folds under and through the larger "L", projecting as a glassy pavilion into the center of the courtyard. This fold creates a centrally located gateway, bookended by administration and community space, that connects the neighborhood to the ravine. 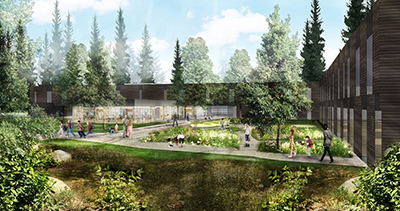 And by reaching out to engage the ravine, the pavilion subdivides the larger community courtyard into areas for nature play and quiet learning. It is with great sadness that we announce to the A4LE community the passing of one of our members, Greg Hepp. Greg was an incredible person who cared deeply about his family, his friends, and his colleagues. His spirit, humor, and good deeds lifted the lives of many and will continue to bring joy to those fortunate to know him. His legacy of sustainable design, leadership, and contributions to the profession of architecture live on. This year's tour provides a unique opportunity: to visit 4 schools, each required to meet the same Educational Specifications, yet with significantly different restricting parameters. The projects range from renovations on tight sites, to replacement schools constructed on larger properties. Registration pays for the bus, lunch, snacks, and beverages. Space is limited. Everyone will be asked to park at Garfield High School, 400 23rd Avenue, and walk to Horace Mann, 2410 E Cherry Street. See site plan attached. This new elementary school doubled the size of the Arbor Heights Elementary School, and provides K-5 students the opportunity to participate in an Environmental Science, Technology, Engineering and Math (E-STEM) program. The new school is approximately 89,000 square feet and accommodates 660 students. It houses four small learning communities that include individual classrooms surrounding an open shared-learning area and an Idea Lab. The learning communities were designed to promote individual and group teaching and enables experiential hands-on and project-based learning. The new Genesee Hill Elementary School is approximately 103,000 square feet and accommodates up to 660 students from the nearby Schmitz Park Elementary. Shared learning spaces are found between classrooms and other spaces are used for special education, art, science, music, and childcare. With the site's significant grade differential and a protected stand of old growth trees, Genesee Hill's six-acre site presented inherent challenges. The original 1949 school and playfields were so separated by distance that they were poorly utilized, whereas the new design makes better use of the entire site and integrates gracefully into the surrounding residential neighborhood. Fairmont Park Elementary School is a completely renovated and modernized building with a new 200-seat classroom addition. 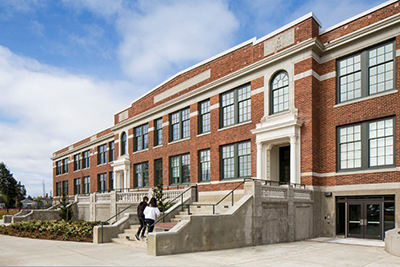 This project addresses current and projected elementary enrollment growth in West Seattle by renovating 40,000 SF of the existing facility and adding a new two-story, 20,000 SF classroom wing. The educational initiatives include Performing Arts, Arts and Technology, Science and Technology, and Special Education. The rehabilitation included roof replacement and exterior wall updates, seismic renovations, improved accessibility, and mechanical/electrical/plumbing system replacements. The Nova High School project included modernizations and improvements to the 33,000-square-foot existing building, along with an addition of a 15,000-square-foot wing constructed on the north side of the property. The modernization included complete mechanical, electrical and plumbing upgrades, seismic upgrades, new exterior siding, refurbished windows, interior finishes and technology improvements. Life safety and accessibility (ADA) improvements were also addressed. An additional vehicle entrance was added for a reconfigured parking lot area and rain gardens were installed to improve storm water discharge. For Salish Middle School, the design team focused on learning environments that allow for adaptive use and increased student population in this rapidly-growing district. It was their goal to incorporate learning opportunities in standard and non-traditional ways throughout the school. One of the most successful design solutions for this growing district was project classrooms located at the entry to each classroom wing or "house." These unique spaces allow flexibility in interaction, learning, and teaching. Easily reconfigured, nontraditional furniture allows for a range of uses, including art exploration, a STEM-focused curriculum, and small or large group projects. 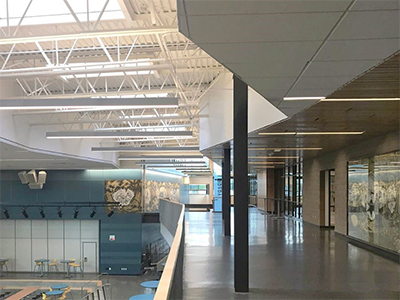 The building prioritizes visibility, cost-reducing daylighting, and visual connections between all grade levels and school administration for a layout that is welcoming, safe, efficient, and easy to monitor. Please join us for a tour of Salish Middle School, 8605 Campus Glen Drive NE, Lacey, WA by BCRA and North Thurston Public Schools. "Green Building Teacher Fellows Program"
Peter Donaldson, Director for Sustainability Ambassadors, will provide an overview of the Green Building Teacher Fellows Program. Master teachers from middle school and high school lead a district-wide, problem-based instructional design process that links science and engineering to civics, economics, and equity issues....meeting educational standards while advancing the green building sector including, cool green schools, affordable housing, and sustainable community development. The Program is a collective impact initiative facilitated by Sustainability Ambassadors and jointly funded by a coalition of leading firms and business. Miller-Hull, Cascade Design Collaborative, and Master Builders Association of King and Snohomish Counties are all early champions. Could this be a new signature program for the Association and our members firms, through which we measure impact and amplify our association mission? Proof of concept already exists. The "Water Systems Teacher Fellows Program," sponsored by Cascade Water Alliance, is supporting 16 Fellows in four school districts reaching over 2,000 students. Mercer Island is committed to addressing educational challenges of the future while embracing community values of integrity, commitment, collaboration and excellence in all aspects of the student experience. In support of this vision, Northwood Elementary School provides the missing link between facility design and academic program; provides a wide variety of differentiated personalized learning environments; finds the tie between curriculum, sustainability and facility design; and leverages on-site partnerships to strengthen the Island community. Occupying approximately 9 acres of a 43 acre district-owned shared-use site, the school is designed to enhance partnership opportunities for the enrichment of both community and education. This is achieved through a carefully crafted site strategy, a sensitive building massing, the programming of interior and exterior learning spaces, and the development of a new curriculum that embraces the site amenities and shared resources. 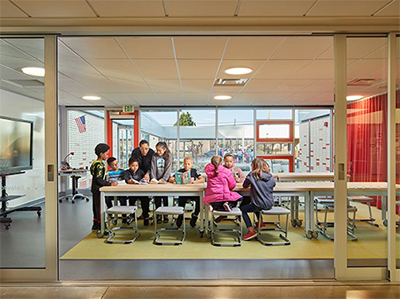 Northwood Elementary was recognized with the 2016 Honor Award by AIA Seattle. 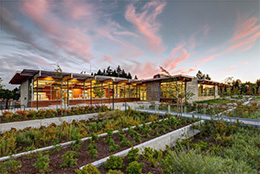 Please join us for a tour of Northwood Elementary School, 4030 86th Ave SE, Mercer Island, WA presented by Mahlum and the Mercer Island School District. "Civic Defragmentation: Learning & Resilience in North Seattle"
We will explore creative strategies for designing the places children inhabit every day as ecologically diverse, culturally expressive, and interconnected. The presentation focuses on how the students multi-scale approach plus community engaged design process maximizes learning opportunities for children throughout the Aurora/Licton Springs and Haller Lake neighborhoods. School District employees' first dinner is free! Spread the word and introduce a new School District employee to the Association, encourage them to sign up online for a free first dinner. We greatly appreciate your attendance and active participation in our chapter events. As a dedicated member of the Association for Learning Environments (initially formed as CEFPI), Chas provided a lion's share of the enthusiasm, leadership and effort to lay the foundation for the Washington Chapter we know today. He was a trusted advisor to the Board of Directors who was always available to help guide the development and improvement of our Chapter. He gave countless hours of his own time to the development of an organizational framework that assures the Washington Chapter will continue to be a local clearing house for the free exchange of ideas and best practices for educational facilities. In this way, Chas was instrumental in the success of the Washington Chapter and its impact on the continual improvement of public school facilities throughout Washington State and Pacific Northwest Region. Chas is a recipient of the Chapter's highest honor, the Al Beck Award, as well as numerous other Chapter, Regional and International awards and recognitions. Initiated and coordinated the Chapters first research project – "Lessons Learned"
Coordinated Dinner Meeting Reservations for many years. Our thoughts and best wishes go out to Chas' family. "Structure & Serendipity: Strategies for the 21st Century Community"
The remodel and addition of Liberty High School focused on changing the facility from an inward focused, infilled, and poorly organized campus to a daylit, open, and accessible school. The team dealt with significant challenges to maintain student safety and keep all utilities and systems functioning without interruption, as the remodel and addition occurred on a sloped site with limited access, was built in 3 phases, while being occupied by students throughout construction. Presentation: "Structure & Serendipity: Strategies for the 21st Century Community"
The presentation will center around current approaches to student-centric design for living learning communities (LLCs) and, through a brief historical discussion and contemporary case studies, proposes potential solutions to what the future of integrated living and learning environments might look like in the future. 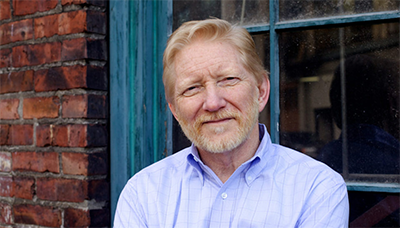 A partner at Mahlum, Kurt is an industry leader in the planning and design of student housing facilities, with more than 22 years of professional practice. Named a Silver Medal School of Distinction in U.S. News and World Report Magazine’s Best High Schools, Woodinville High School stands as one of Washington State’s premier public education facilities. Studio Meng Strazzara’s design of the multi-phased project reconnects the campus and combines all academics in a single facility unified by its large central commons. This $71 million, 239,000 square foot project involved the replacement of nearly every building on campus, with the exception of the Gym and Arts & Technology Building. Working under a GC/CM contract, the project spanned three successful bond cycles and was constructed on an active campus over several academic school years. The collaboration between the design team, contractor, school staff, and students has led to a beautiful, cohesive facility that supports education both now and in the future. 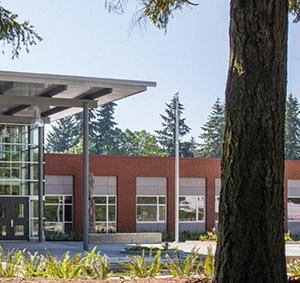 Please join us for a tour of Woodinville High School, 19819 136th Ave NE, Woodinville, WA 98072, presented by Studio Meng Strazzara and the Northshore School District. "Future Ready Teaching and Learning"
Please join us for an informative conversation addressing the foundation of ASCD (Association for Supervision and Curriculum Development), a global community that is dedicated to excellence in learning, teaching, and leading. Dr. Gbenro and the panel will introduce the research around Future Ready Learning, and the impact of integrative technology on the way students actually learn due to the neuroplasticity of their brains. The opportunities for members of the Association to partner with educators will also be discussed. The new Vashon Island High School is the product of its place and people. Located on a small island in Puget Sound, its community has an enduring sense of their unique culture, with its natural beauty, geographic isolation, and artistic vitality. The design team preserved this sense of connection by imparting a porosity to the building, which defines how the building supports spatial connections, how students move in and out of the building, and ultimately how the students themselves become the life force of the building and site. The result is an overlapping fabric of inner and outer spaces animated by light, transparency, and movement. Learning at the high school occurs anywhere – and everywhere – with a wide variety of learning spaces distributed throughout the entire school and campus. Shared areas are adjacent to teaching spaces, a Learning Commons extends the Library into the life of the student body, and a small-group presentation room is perched within the Learning Commons. A central courtyard provides sheltered outdoor learning areas, and found spaces throughout the building are used for individual and small-group work. Together, this collection of student-centered spaces projects the optimism of the island community towards its students by honoring them with features that facilitate learning. Vashon Island High School was a finalist for the 2015 MacConnell Award, winner of the 2015 Pinnacle Award, winner of the 2015 AIA CAE Education Facility Design Award, and 2015 AIA Civic Design Honor Award winner. Presentation: "The Advantages and Disadvantages of the GC/CM Project Delivery Method – A Panel Discussion"
Please join us for an informative conversation addressing the advantages and disadvantages of the General Contractor/Construction Manager project delivery method. Topics of discussion will include the procurement process, the importance of team continuity, cost/budget management issues, agency certification, along with many others. Auburn High School was relocated from 4th street to a prominent presence on Main Street, this major addition and renovation reinvigorates the Auburn High School facility for another 100 years with a classic look reminiscent of the original 1929 High School. Auburn's certified CTE programs provide graduates with career-ready skills. In addition to renovated auto, wood and welding shops, the Robotics program provides integrated learning opportunities with electronics, metalworking and drafting labs. The Culinary Arts Program is supported by local restaurants and linked to local colleges, in addition to running an on-school teaching café. Specialized Consultants (Acoustical, Lighting, Theater, Cost, Value Analysis) – Theater & Theater Lighting – PLA Designs Hardware – Adams Consulting Abatement – PBS Environmental Acoustics – SSA Acoustics General Contractor – Lydig Construction, Inc. Designed by the noted architect Paul Thiry, Cedar Park School opened in 1959 as a response to the rapid increase in school enrollment in the 1950’s. By 1981 the student population had dwindled and the school was closed and leased to an Art Community. The building was converted into artists’ residences and studios and the community that occupied the space became a great steward of the property. Now, over 30 years later, the community is once again facing dramatic increases in enrollment, and Seattle Public Schools decided to renovate and reopen the school in 2015. The school is designated as a Seattle landmark in large part due to its innovative structural system. And while the exposed and regularly spaced precast concrete frames, tilt-up concrete walls, and precast concrete roof panels exemplify Northwest Modernism, they also created challenges in the renovation and seismic upgrades that would be required to reopen this Modernist Gem for a new generation. The new Rose Hill Middle School campus houses both a traditional 6-8 middle school and Stella Schola – an alternative exploratory learning program that integrates core subjects such as reading, writing, mathematics, social studies, science, and music into historical themes at each grade level. The two programs share whole school amenities while maintaining autonomy in clustered classrooms, labs, admin areas, and entries. The undulating topography was used to advantage by weaving in various levels of outdoor learning spaces with podiums and platforms to allow for educational delivery outside of the traditional classroom spaces. The topography also allowed for inclusion of an amphitheater in the protected courtyard adjacent to the student commons. Learning areas are designed for flexibility. Moveable walls and furniture enable a variety of learning configurations. Flexibility was tested during the design by identifying 5, 10, and 50 year walls to determine where major systems would be located (50 year walls) and where curricular change could drive spatial changes (5 and 10 year walls). Numerous aspects of the school were designed with adaptability in mind. The learning communities are shaped to accommodate numerous curricular models- from departmental to integrated teaching approaches and grade-based to autonomous programs. Technology access (wired and wireless) is ubiquitous- encouraging a “learning happens everywhere” attitude. Hands-on learning spaces (labs and studios) are distributed throughout the facility. Indoor/outdoor connections are also provided to encourage exploratory learning opportunities. 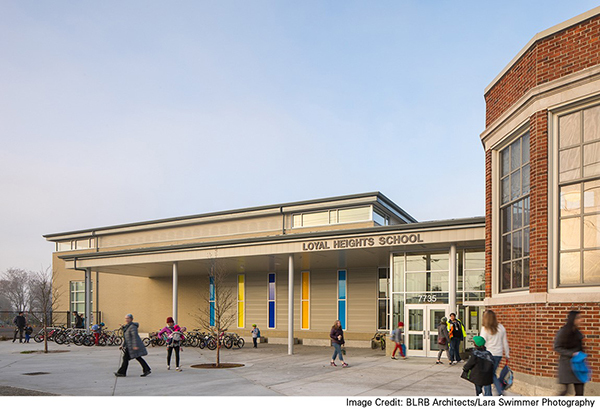 Please join us for a tour of Rose Hill Middle School/Stella Schola, presented by Bassetti Architects and Lake Washington School District. "This is the Future: Inglemoor Design, Engineering, Architecture (IDEA)"
Guests will be able to visit 2 selected art exhibits in the museum, Dale Chihuly Collection and Northwest in the West: Exploring our Roots, from 6:15 to 7:15 pm at no charge. Dinner will be served and as is our tradition for the holidays is at no charge to our guests. Guests will receive 2 drink tickets, additional beverages will be no-host. 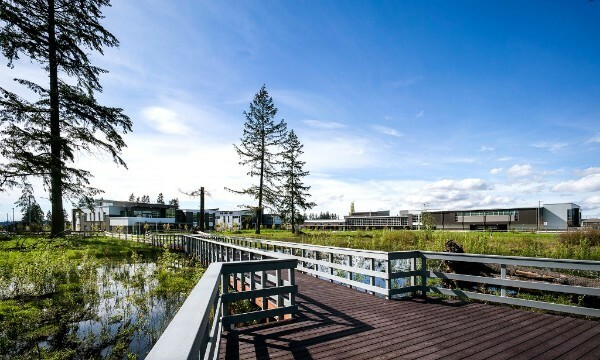 Relocated to a parcel once occupied by the Olympia School District's McKinley Elementary, the new Olympia Regional Learning Academy (ORLA) restores education and vibrancy to its site through a garden-like setting offering students a range of indoor and outdoor learning experiences. ORLA is a multi-use learning venue, suiting the specialized needs of its four user groups, including: “hConnect”, a resource for home-school families offering a multitude of courses as supplementary education; “ORLA Montessori”, a K-5 program suited to a more hands-on and self-directed style of learning; and “iConnect Academy”, an online option for grades 6-12. 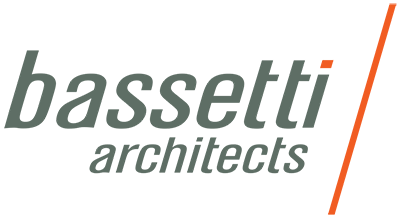 The On-Line Development Center serves as a District-wide eLearning resource for all schools, and provides professional development opportunities for teachers. The academy’s generous hallways, interspersed with informal gathering spaces, form an easy-to-monitor, secure layout, that accommodate the flow of large families, parents with strollers, and visitor groups. Family members are invited to wait on-campus while students attend classes, and atypical amenities facilitate their comfort and convenience – allowing flexible space to eat, play, entertain toddlers, relax, and conduct business. While iConnect, hConnect, ORLA Montessori and the ODC are generally located by zone, cross-over use of special purpose spaces such as the cooking classroom, roof top gardens and science labs is encouraged. Shared by all, and representing the symbolic ‘heart’ of the school, the commons/performing arts center provides an expansive, multi-functional place for all ORLA learners to unite. Combined input and expertise – contributed during design by district and school staff, parents, the general contractor and design team through GC/CM delivery – shaped the creation of the school’s cutting edge systems, strategies for sustainability and unique aesthetic. 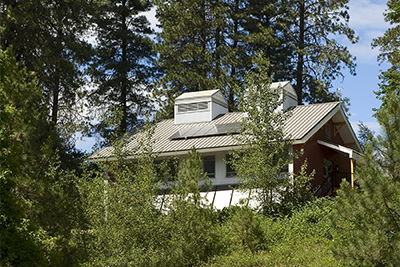 The final Energy Life Cycle Cost Analysis resulted in an EUI (Energy Use Intensity) of 24.7 without renewables, bringing the high performance building into the range of achieving a cost-efficient, net-zero energy status, once rooftop photovoltaic panels are purchased and installed. Shorecrest High School is a comprehensive high school that replaced existing programs while planning for long-term growth. The Shoreline School District is particularly unique in that it decided to replace the district’s two high schools simultaneously, with two different design teams, while maintaining student programs. The phasing of this project is particularly fascinating as the students and their programs remained functional on-site during the whole development the site. The design process focused on the integration of primary building systems including HVAC, daylighting, and an efficient building envelope. The selected mechanical system was evaluated for energy consumption, first cost, life-cycle cost, and integration with other systems. Extensive use of rain gardens eliminated any need for below-grade storm water retention. In anticipation of changing curriculum needs the school buildings were developed with the approach that the buildings envelopes were to last 100 years, and the internal functions of the building needed to be adaptable to changing educational modalities. This resulted in a process of design that carefully considered structural order, mechanical HVAC and plumbing routing, and test-fit programs throughout the building to anticipate future modifications. Strategies to minimize the number of materials needed to provide durable surfaces were integrated into the design. Thus, concrete and block walls serve multiple purposes - providing gravity and seismic structural needs, providing thermal mass to minimize the impact of temperature swings (both in floors and walls), and exposed block and concrete walls are durable and will not require life-long painting and patching. Another interesting aspect of this high school is its responsiveness to site. Shorecrest High School is on a large site in a residential neighborhood with only one street as a neighbor, resulting in a campus-style development with three separate buildings. Inge Marcus School of Engineering will be brought to us by McGranahan Architects. The new Cebula Hall is a 26,900 s.f. 3-story facility that contains an Environmental Lab, Structures Lab, Thermal engineering Lab, Materials lab, CAD Modeling Lab, classrooms, seminar spaces, conference rooms, an engineering library, collaborative learning settings, administrative space for faculty and the dean of the Hal and Inge Marcus School of Engineering. The arrangement of spaces in the Cebula Hall focuses on beneficial relationships that encourage collaboration and educational cross pollination. Transparency, proximity and access to shared spaces are key to the success. Spaces inside and out are organized to capitalize on collaborative and impromptu learning opportunities. The result is a healthy environment that makes studying, researching and discussing invigorating, effective and immersive. Many of the building’s structural, civil and mechanical systems are displayed or “peeled back” to facilitate dialogue and support the school’s curriculum by surrounding faculty and students with real world examples of their studies. The roof lab includes two dual axis solar panels that allow students to study the benefits of tracking devices, solar orientation and the production of solar energy. This will be an area of research and study for the school given the importance of affordable renewable energy sources and the influence that engineering will have on solving that challenge. This project utilized a “team build” process which brought the general contractor and consultants on board early in the design process. 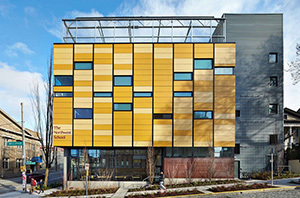 Through a collaborative effort between the University, architect, engineers, general contractor and consultants, a goal of LEED Platinum was set and achieved: Cebula Hall scored 97 out of 110 LEED points making it the highest rated LEED Platinum building in the Western Hemisphere and 3rd highest in the world. The building was completed for a modest $225 per square foot and boasts an EUI of 18.25 kBtu/ft2. The University expressed a desire to have solar photovoltaics. 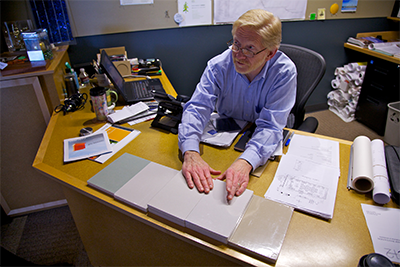 The design team elected to use a thin film technology that was integrated directly into the roofing material. Not requiring an upgraded structural system or solar racking system helped keep the costs in line and also allowed for two dual axis solar tracking arrays. Tracking arrays were provided for student interaction and training on an adjacent rooftop lab. Kerry Goodwin of Sonitrol will be discussing the latest in school safety technology. Jesus M. Villahermosa, Jr. a nationally recognized expert in school and workplace related violence will present "Crisis Reality Training". Jesus’s provoking ideas given with a humorous note and interactive style will surely inspire us to help make our school a safer place to learn, teach, and work! 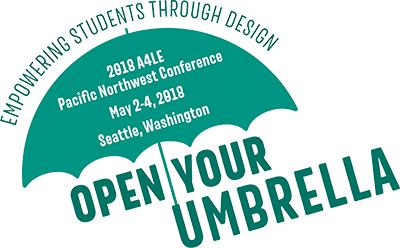 This will be a unique school tour, as the Shoreline School District decided to replace its two high schools simultaneously, with two different design teams (Bassetti and Integrus), while maintaining student programs. Shoreline Schools planned and re-built Shorewood and Shorecrest High Schools ( June 25th tour with Integrus) on parallel timelines, resulting in the largest amount of construction in the history of Shoreline. The incorporation of the landmarked Ronald School building into the new design not only reinforces the importance of the history and culture of the community, but also shows a dynamic solution that can evolve from the integration of 21st century learning and a 100 year old school building. By designing to minimize the building footprint, the team enabled a more efficient use of site with fields, courts, and parking. The school is seamlessly zoned for public use in evenings and on weekends. Walking and biking to school benefits student health and can reduce vehicle congestion around school sites. Chris Saleeba (Senior Urban Designer with Cascade Design Collaborative) and Brian Dougherty (Safe Routes to School Coordinator at Seattle Department of Transportation) will discuss the planning and implementation of street improvement projects that aim to increase safety and promote walking and biking to school. They will also review funding strategies and present recent case studies that showcase how school districts and municipalities can work together to improve active transportation infrastructure. We will be touring the Bethel School District Central Kitchen & Transportation Facility presented by Bassetti Architects. 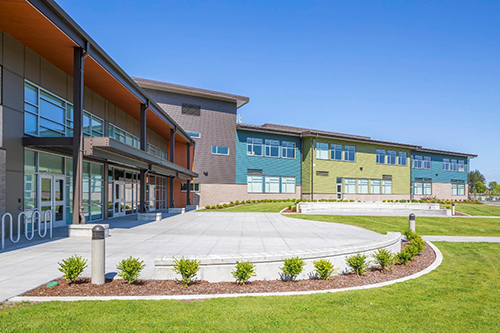 The first design-build project authorized for a K-12 District in Washington enabled the district to get the maximum useful facility on a limited budget. Use of Revit for both and construction and design documents along with the use of the Revit model in the field by the construction team. Implementation Blubeam software with tables for as-builts, M&O manuals and punch lists. Jim Hansen, Director of Construction & Planning Bethel School District, will discuss the Design Build process. Bethel's Central Kitchen & Transportation Facility is the first design build project by a public school district in the state of Washington. Chinook Middle School's mission is to provide an exemplary college preparatory education that will establish a strong foundation for the success of students' future educational and life pursuits. Accordingly, development of a flexible, personalized educational environment that supports multiple programs and instructional methodologies became the overarching theme for Chinook's replacement, as developed by the project planning committee. The provision of outdoor space for learning and social interaction, and the integration of interior and exterior environments were additional design drivers. Home to more than 1,000 students, the scale of this 143,500 SF school is mitigated through a design solution that features two academic wings emanating from a central core that houses the commons, music and theater programs, and connects via a 'main street' circulation spine to the gymnasium and athletic program areas. Jean-Claude Letourneau of Schacht Aslani Architects will be speaking on the new LCCT guidelines. What Makes this Educational Facility of Interest to School District Planners? As our population grows and the density of cities and urban metro areas increases, tighter sites and the urban context for schools will become more prevalent. One of the barriers for families returning to cities has been the paucity of both quality urban schools and areas for fitness and outdoor play. This building provides a model for a vertical layering, and engagement with the urban context that will become more prevalent in the coming years. The Northwest School is a 450-student independent school housed in the historic Summit School building in Seattle's Capitol Hill neighborhood. The new gymnasium, dining and theater facility represents a significant expansion of the campus and a new face for the school on bustling Pike Street. With this prominent urban location, the new 30,000 SF building is designed to integrate program-driven learning, gathering and play spaces within the rich fabric of this dense urban environment, enriching community within and around the school. In this way, the project serves as an interesting case study for school district planners considering the development of new school buildings within the inner city and other dense sites. Outdoor Learning – Elements, Attributes & Curriculum: A One Day Symposium exploring the challenges and opportunities to create effective outdoor learning environments. 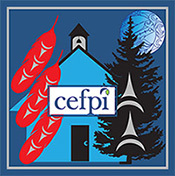 The symposium will be led by a panel of experts from OSPI, educators from Tacoma's SAMI School the Mercer Island School district and independent environmental consultants. As the state implements the Washington State Next Generation Science Standards (NGSS) all districts will need to address new modalities of learning. One opportunity will be to move learning out of the classroom and into the landscape. This symposium will begin with a core presentation of the NGSS by Gilda Wheeler (Program Supervisor, Sustainability and Science – OSPI) and Fred Rundle (Director of Learning Services – Mercer Island SD). Small groups will be lead on an extended investigation of the Reserve, exploring opportunities and applications of the NGSS. Lunch will be provided. The afternoon will allow for personal investigation and reflection on the NGSS in the landscape culminating in a group discussion and distillation of ideas at the historic main residence. 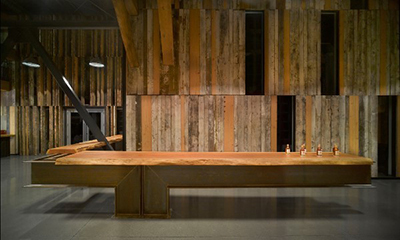 Recently recognized locally by the AIA Washington Council Civic Awards and nationally by AIA CAE Design Awards. Support your Chapter with our primary fundraiser for the year. ...is a nonprofit program supported by government agencies, individuals, businesses and foundations. Its robust educational resources are available to all public and private K-12 schools in Washington state. Washington Green Schools challenges students and communities to create a sustainable region through educational experiences that transform school environments. Join your friends and colleagues for this celebration of quality learning environments. View the schools, enjoy the box lunch, and let the bus driver worry about traffic and parking. Relax, learn and make new friends in the school facilities community. Sister Schools teaches compassion, service, and social responsibility by partnering students in donor schools with children in need. ...is a backbone organization facilitating collective impact to improve sustainable community conditions across generations and sectors. We integrate measures of community sustainability with measures of student achievement so that learning is rigorous, relevant and related to real-world community problem-solving.